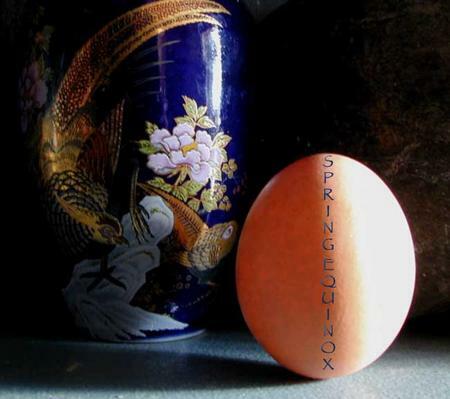 Spring Equinox has arrived and once again I have encouraged people everywhere to join me in co-creating the funky ceremony of balancing an egg on its end. I have been doing so for decades but when it really started to take on a whole new meaning for me was when the American military began its invasion of Iraq on the day of the Spring Equinox. George Bush was spouting his axis of evil slogan and it occurred to me that he had it all wrong! When the phrase axis of equal popped into my head, I took it as a signal to try to set things right. I know that such a simple act may seem rather trite in the face of the horrors of war but it cultivates a tangible feeling of connectedness to cosmic order that has to be experienced in order to be fully appreciated. When expanded to a global scale and performed simultaneously by people everywhere as a statement of intent to manifest peace in the world, it takes on a whole new character. It becomes a ritual act presenting a healing image of peaceful co-creation. This is the ongoing vision for this work and twice a year, the opportunity returns to each of us to step forward in this simple way. Why not consider joining me in performimg this simple act at the Fall Equinox, September 22, 2006?